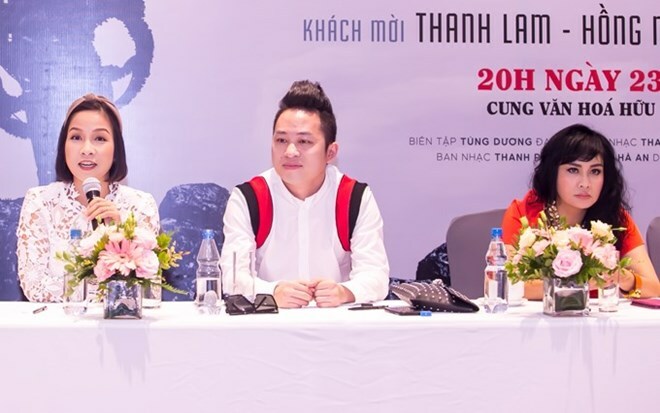 Hanoi (VNS/VNA) - A special show, scheduled to take place in Hanoi next month, will see four Vietnamese divas perform alongside singer Tung Duong, who is well-known for his not-for-everyone music. Thanh Lam, Hong Nhung, My Linh, and Ha Tran, dubbed as ’Vietnam’s four divas’, will perform at the live show, entitled Troi va Dat (Heaven and Earth). The show is the first solo concert by Duong since the Mot thap ky hoan ca (A decade of joyful singing) in December 2015 which was to mark his decade-long career since he won the Morning Star - Rendezvous 2004 singing contest. As an avant-garde artist in Vietnam, Duong has never tired of trying new things. He has challenged himself with different fusions of musical styles, which sometimes also defy the audience’s taste. He knows how to amaze his audiences whenever he is on stage with his haunting passionate voice and unique performing style. Ignoring many anti-fan insisting that his music is too weird for the majority of Vietnamese audience, Duong remains determined to stay on the path he has chosen and enjoys his results, including sold out concerts, popular albums, and a record of eight Devotion Awards – the Vietnamese ‘Grammys’. Attending the press conference on the show in Hanoi last week, diva My Linh said that Duong, only 9 at the time, made a strong impression on her when they first met in 1992. “When he started singing, his eyes sparkled and his face lit up. He was very special at that moment. And so far, he is still as special as he was back then,” she said. She also promised that, together with three other divas, she will help the divo put on his “best performance”. At the upcoming Heaven and Earth performance, some of Duong’s hits such as Mua bay thap co (Rain over the ancient tower), Giang to (Web spinning), Doc dao (The unique path), and Li ti (Tiny) will be remixed in a futuristic style, which is a blend of experimental sounds inspired by machinery. “Unlike any of my previous shows, where I performed different genres including folk, world music, rock, pop, jazz, and semi-classic, this time, my audiences will see me in another fresh style,” the singer said.